Web 2.0 tools and context; The modern business environment; From purpose to space; From space to function; From function to use; Putting it together; Conclusion. Whilst enterprise technology departments have been steadily building their information and knowledge management portfolios, the Internet has generated new sets of tools and capabilities which provide opportunities and challenges for improving and enriching knowledge work. 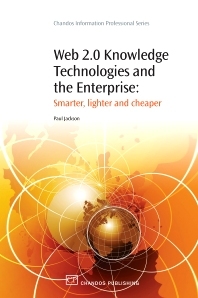 This book fills the gap between strategy and technology by focussing upon the functional capabilities of Web 2.0 in corporate environments and matching these to specific types of information requirement and behaviour. It takes a resource based view of the firm: why and how can the knowledge capabilities and information assets of organisations be better leveraged using Web 2.0 tools? Identifying the underlying benefits requires the use of frameworks beyond profitability and cost control. Some of these perspectives are not in the usual business vocabulary, but when applied, demonstrate the role that can be played by Web 2.0, how to manage towards these and how to assess success. Transactive memory systems, social uncertainty, identity theory, network dynamics, complexity theory, organisational memory and the demographics of inter- generational change are not part of normal business parlance but can be used to clarify Web 2.0 application and potentiality. Dr Paul Jackson is an information and knowledge management specialist who has been a systems developer, product development and project director, strategic consultant and university lecturer during an international career spanning 25 years. He has published widely and consults to government and industry.